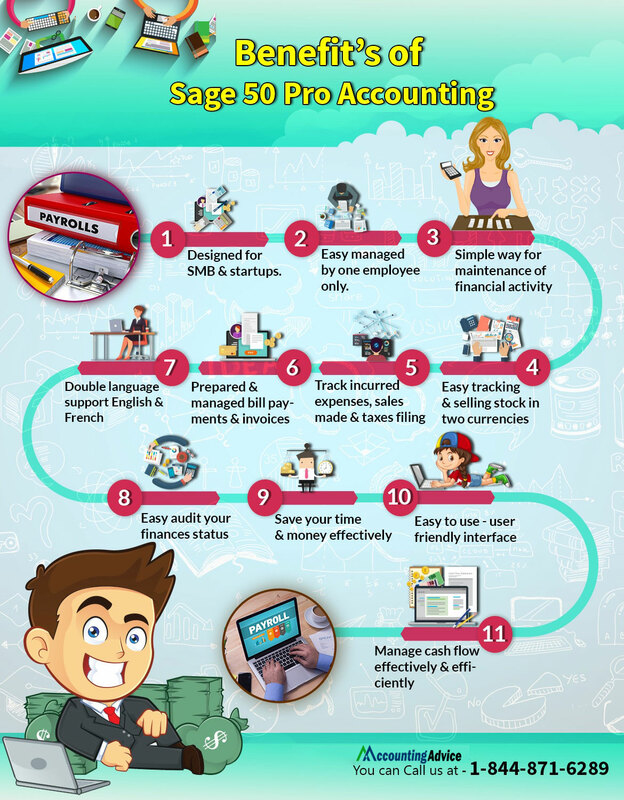 Sage 50 Pro Accounting software incepted by the company with same name SAGE, is one of the best blessing in disguise for small businesses and startups. It is basically for small companies having 4-10 employees and offers only for one user. These constraints of only one user makes it not ideal for big companies but just about perfect where only one employee need access to the Sage 50 Pro Accounting software. Maintain your business finances with Sage 50 Pro Accounting without any hassle. It is considered to be the apt software for small companies that are located only in one place and the access to the software is provided to just one employee. It accords companies and businesses with powerful solutions for handling and managing business effectively. With the software’s powerful tools you can keep an on your sales, incurred expenses and make right decisions to control outflow of cash as well as keeping up with your stocks. It is basically designed for small companies and startups that do not have large number of employees and the software is managed by one employee only. Paves the way for easier maintenance of financial tasks and activities like cash flow transactions, deciding up on project budgets and tracking and selling stock in two currencies. Intuitive tools that allows for keeping an eye on the expenses incurred, sales made and taxes filing. Bill payments and invoices can also be prepared, managed and tracked without any fuss. Dual Language Switch – English and French. Tool like Audit trial keeps you informed of the accuracy for your finances. A professional and advantageous edge over other companies that helps to save time as well as money. User friendly interface perfect for even freshers in accounting field. Equipped with features that help to process and keep a check on the flow of cash to and from the company. Operating System: Microsoft Windows 10, Microsoft Windows 8, Microsoft Windows 7 and Microsoft Windows Vista. With Sage 50 Pro Accounting software you can easily track your business finances and move it forward to new heights by being in control of your cash flow. The software ensures that you are organized and have all your required information in one place. Also full accessibility from anywhere and at anytime is guaranteed with cloud access to the software. The subscription plans designed for the software are structured to provide maximum benefit at affordable range. Furthermore, you are always kept up to date with regular upgrade releases for the software along with swift and prompt connection with the support team. Handle your investment, tackle your payroll processes and credit – debit card integration is what you achieve with Sage 50 Pro Accounting software. With facilities like structuring quotes and sales forms, invoicing the customers for payment and then keeping track for the payment without much manual input results in zero errors and swift completion of the process. You can also integrate Credit card with your software that leads to faster payment as customers only need to click on payment button to pay electronically. With Sage 50 Pro Accounting you can utilize ‘Forecast’ function that will provide as accurate information regarding your cash flow as possible by looking at the past transactions. You can also use ‘What If’ tool to prejudge a decision and its implication on the finances before zeroing on any strategy. You can now keep an eye on all business financial activities without much interference. You should keep a record of all your bills that have been paid or need to be, while at the same time processing the credit transactions made. Sage 50 Pro Accounting software does provide only limited access to one single individual, but at the same time offers accounting solution like never before. With this software you can perform all your business financial tasks without leaving any scope of mistakes as all the processes are performed mechanically and not manually. As long as the information you provide in the starting is accurate, the result will never be wrong. In case you end up getting stuck in a scenario where your software is not responding as it should you can connect with the esteemed technical experts of Sage software, experienced in handling all sorts of software issues. If you are unable to get in touch with the support team, you can link up with accountingadvice.co through Toll Free Number 1800-961-4623.